The Chicago River Rowing & Paddling Center (CRRPC) is the premier facility for rowing, canoeing and kayaking on the Chicago River, as well as the first truly “green” point of access to the River for human powered craft, located within easy walking and bike-riding distance of ten of thousands of downtown residents and workers. For the purely recreational boater, the river provides an absolutely captivating tour of the city and its world-class architectural vistas, including a breathtaking array of historical bridges, from the highly personalized perspective of a small self-propelled boat on the water. As a training course for competitive rowing, the endless flat miles of the river are not only unsurpassed in the Chicago area, but also among the best in the nation. 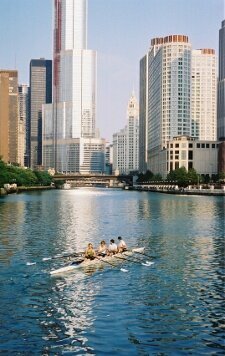 For paddlers the river is the source of both touring an urban waterway and access to Lake Michigan. © Copyright 2016, CRRPC Urban Sculls, All rights reserved.